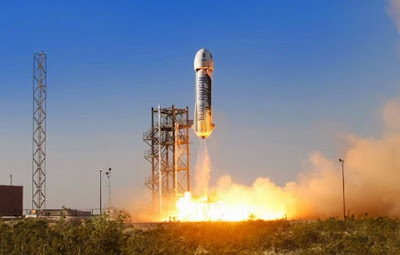 Amazon CEO Jeff Bezos, who is also CEO of the space tourism company, Blue Origin, offered to send Donald Trump into space following negative remarks Trump made about the Washington Post, which is also owned by Bezos. Trump went attacked Bezo's companies on Twitter after the Washington Post published a serious of columns vilifying the GOP front-runner as a demagogue. "The Washington Post is going out of its way to tell failing candidates how to beat Donald Trump. The Post doesn't get that I'm good at winning," Trump tweeted. The tweets which appear to have precipitated a reply from Bezos was when Trump attacked both Bezos and Amazon along with the Washington Post. Bezos not only replied to Trump's tweets, but also started the hashtag, #sendDonaldtospace, which was quickly capitalized by Trump's opponents on Twitter. The chides between the two men on social media underscore the opposing interests of Main Street vs. Wall Street and American nationalism vs. corporate globalism when it comes to companies, especially Amazon, avoiding taxes and receiving government subsidies while hiring foreign workers - issues that Trump has made a hallmark of his campaign.